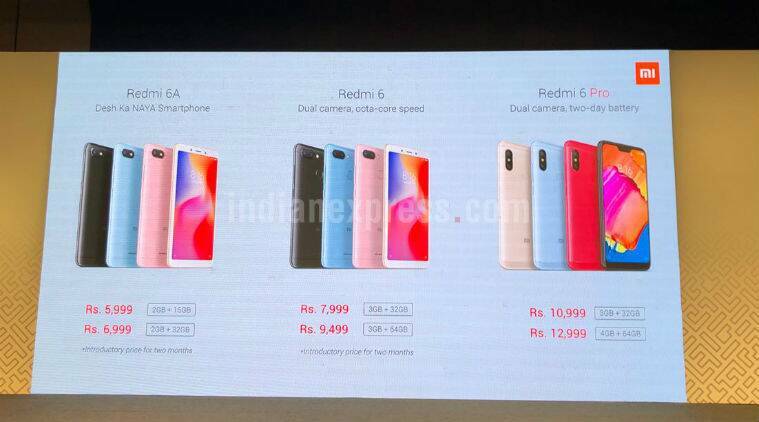 The 3 phones launched by the starting of this week were named as Redmi 6A, Redmi 6 and Redmi 6 Pro. Among them, 6A is an entry-level smartphone, whereas 6 and 6 Pro are budget-centric. Let us quickly discuss the specs of the three phones. In the design section, 6 and 6A, both of them come with a plastic back but the 6A doesn’t feature a fingerprint sensor as its predecessor Redmi 5A. Both the phones have a 5.45-inch HD+ display with 720x1440 resolution and 295 PPI pixel density. Both have 18:9 aspect ratio, like the note series, released in March 2018. While the Pro version of the 6 series includes some upgrades in design, where it packs a metal back with upper and lower body section having plastic on it. It also gets upgraded display with 19:9 aspect ratio, 5.84-inch Full HD+ display with 435 PPI pixel density and a notch, though the bezels and the chin are pretty thick. In the hardware department, Xiaomi moved to Mediatek this time after so many years with Snapdragon, but only with the 6 and 6A. They will be featuring the Mediatek’s new releases Helio P22 and Helio A22 respectively. Honestly, the processors aren’t that bad, but in India, smartphone users are very much attracted to snapdragon. This may affect the 6 series sales. On the other hand, Redmi 6 pro contains the old companion of Xiaomi, the Snapdragon 625. The processor is good, but not the latest one. As this doesn’t support dual VoLTE, AI functionalities like the Helio A22 and P22. It is also based on 14 nm process, unlike A22 and P22’s 12 nm process. But it does support Full HD resolution which both the MediaTek processors doesn’t. So both of them have their separate pros and cons. In the software section, three phones provide the same, as all of them runs on MIUI 9 based on Android 8.1 Oreo out of the box. This is the only similarity in the three phones. In the optics section, three phones are totally different. The basic one, 6A, provides single 13 MP with f/2.2 aperture and PDAF support and a 5 MP selfie camera with f/2.2 aperture. Coming to the mid version, it has a dual rear camera setup with a 12 MP camera with f/2.2, with 1.25 μm pixel size and a 5 MP depth sensor with f/2.2 aperture and 1.12 μm pixel size. In the front side, it provides 5 MP sensor in it. The pro version packs the same camera module in it as the Redmi 6, but with the gyro-EIS support. All the phones support Bluetooth 4.2, W-fi 802.11 b/g/n (the pro version supports Wi-Fi a version too), 6 and 6 Pro have a fingerprint sensor on the rear side, IR blaster, all the necessary sensors and micro USB port. Yes, no one, including the pro version, contains the USB type c port. The Pro version contains a 4000 maH battery and others have 3000 maH both. It may be enough for 6A but for 6 it's quite disappointing. As the predecessors of Redmi 6, the Redmi 4 and 5 had better batteries (4100 and 3300 respectively). Can you even imagine now how the Redmi 10 will be? Now, can the 6 series gain the position of Xiaomi back in the market or will these be the one among all smartphones? Well, this is tough, as all the phones provide a different range of features. The buyers have a work of choosing the best for them. But in Indian market snapdragon is so popular, that phones with Mediatek may face difficulties to stand parallel. The phones also concentrate more on looks with displays and notch rather than performance. Let’s wait for the sales.